A devastating flood seems much more of a possibility in the South Bay after some neighborhoods went underwater last month. But one community faces a bigger threat than others, especially in the event of a big earthquake. The Santa Clara Valley Water District held a public meeting Wednesday night in Morgan Hill on the seismic retrofitting needed for Anderson Dam, which experts say would flood nearby communities if it collapsed in an earthquake. The project has been pushed back after the discovery of additional seismic complications. "The project has been extended because it's a much larger effort than we originally expected when we started the project work back in 2012," Katherine Oven, deputy operating officer for the water district, said at the meeting. Morgan Hill residents in attendance had a slew of questions. A devastating flood seems much more of a possibility in the South Bay after some neighborhoods went under water last month. But one community faces a bigger threat than others. Robert Handa reports. "Why weren't they concerned about fixing this back then?" asked Craig Martin. "Failure of that dam destroys the city, or damages it immensely. ... What else don't we know?" When it's full, Anderson Reservoir holds about 90,000 acre feet of water, more than the other nine South Bay reservoirs combined. Longtime Morgan Hill resident Ken Saso says he's aware of the dam's well documented structural flaws and what could happen if a major earthquake caused a collapse. "All of us would be underwater, that's for sure," Saso said. "And probably similar to what happened in San Jose, if not worse." The water district won't be able to provide much comfort. It has been able to temporarily solve the breach of the canal that caused a flood on Highway 101. 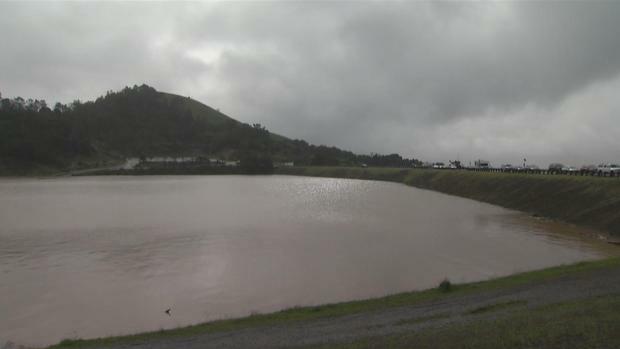 But district officials will be telling residents what NBC Bay Area reported in December: that a combination of liquefiable materials and trace faults means the retrofit of the dam will be delayed from 2018 to 2020 and will be a much bigger project. "We're gonna have to take down almost the entire dam," Oven said. "We're going to have to deconstruct it, rebuild the core and then rebuild the embankments on either side." Water levels in the reservoir need to drop another 20 percent right now for it to be safe. When asked why the water district didn't release water last December, before the storms, to keep it at a safe level, Oven said "it was very low in December. We were well below the restricted level, and we've got to balance that with water supply." The revised timetable for the project worries Saso as well as other residents. "You're aware of the possibility of flooding because of the weather and the amount of rain you're getting," he said. "Whereas with an earthquake, you don't get very much warning whatsoever."